WW1 Reenactments Equipment : Great War Tommy WW1 Documents, Paperwork : Various WWI period Envelopes, 1914-1918. WW1 Reproductions and WW1 Reenactors Equipment / Kit - Various WWI period Envelopes, 1914-1918. Various WWI period Envelopes, 1914-1918. 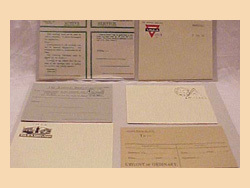 Various period envelopes for the pocket book or correspondence - Y.M.C.A. headed envelopes with or without field post office and censor stamps, Message envelope, etc. 5 different for £9. plus War Economy label & Censor stamp. Selection may vary.